Online Poker New York - It's Legal & Legit Real Money Sites Exist! 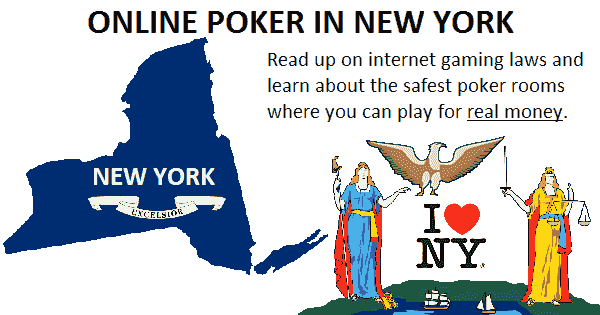 New York online poker is a diverting form of entertainment that many of the state's residents eagerly participate in. You might be under the impression that it's against the law to play the games you love over the internet, but this is not true. Online poker in New York carries no penalties or risks of legal persecution for individual players. New York has had a very long and tenuous relationship with online poker. On one hand, the online poker landscape was changed forever when the district attorney of Southern New York, Preet Bharara, brought charges against PokerStars, Full Tilt and Absolute Poker/Ultimate Bet in what is now known as “Black Friday.” On the other hand, it was one of the two states that asked the federal government to clarify what exactly constituted illegal gambling in late 2011 and for further clarification as to the definition of the Wire Act. This led to a determination that the Wire Act did not apply to online poker and thus made the provisions of the UIGEA irrelevant for card games played over the internet. These vacillations on both sides of the issue have caused some sites to not want to offer games to those in New York, but some offshore gambling enterprises have decided that the situation is still good enough to operate within. Below is some quick information on the sites that still offer games to those in New York and the perks you can get for playing on those networks. 11. Address in Nearby State? What Online Poker Sites Can I Play in New York? While some operators have elected to exit the New York market, others feel that the population of potential players in the state is too large to ignore. We've checked out all these companies to verify that they're honest, reliable, and competent when it comes to their poker games and software products. Simply read the descriptions below, and when you see a site that looks like it might be right for you, click to sign up to it and begin playing today. The largest U.S.-facing online poker entity, Ignition Poker, has recently opened its doors to players from the Empire State. This is good news if you're a New Yorker because Ignition is one of the most highly regarded real money gaming firms to service Americans. When you create your account and make a deposit, you'll qualify for a 100% up to $1,000 poker bonus. It will pay you back 30% of the fees you pay in SNGs and multi-table tournaments. The rate of return is a bit less in cash games but is still quite profitable. Though the player traffic here is greater than at any other U.S.A. internet poker room, you'd be hard pressed to identify any of the horde that you'll be competing against. This is because of the PaiWangLuo Network's anonymous poker tables. You see, whenever you sit in a game – whether cash, sit n' go, or tourney – your opponents will only see a randomly generated player number next to your seat. All your adversaries will be shown to you in the same way. While a few poker pros have expressed disappointment because Ignition renders their powerful long-term tracking tools useless, recreational users have quite a different opinion. In fact, Ignition is renowned for its ability to attract casual players, and so the game quality here is truly something to behold. Suffice it to say, as long as you have a solid head on your shoulders and you've filled it with poker knowledge, you should clean up nicely in these games. Cash tables run from $0.02/$0.05 up through $10/$20 for NLHE, PLO, and PLO/8. Fixed-limit enthusiasts aren't out of luck either because Limit Hold'em and Limit Omaha-8 are spread as high as $30/$60. Zone Poker is a fast-fold poker game that enables you to fold your hand whenever you want and be instantly transported to a new table to begin another hand. The pace is pretty quick in Zone because there's no need to wait for hands you're not involved in to finish, and so you can run through many more hands in an hour than you could at a regular poker table. Sit-and-goes are listed between $1 + $0.05 and $200 + $14. There are a few unique types of SNG here, including Beginners contests that pay out more prizes than is standard and Triple Ups that allow one-third of the participants to walk away with 3x the buyin. In late 2017, Ignition debuted Jackpot Sit & Gos, which rely upon a random multiplier to decide upon the prize pool. The highest multiplier value is 1,200 times the buyin: a pretty nice payday to strive for if fortune should smile upon you. Multi-table tournaments are perhaps even more intriguing because they award no less than $1.5 million in guaranteed prizes per week. The biggest regularly scheduled guarantee is $100,000, which you can enjoy every Sunday for a cost of $150 + $12. There are also frequent tourney series, like the Golden Spade Poker Open, that hand out millions of dollars in prizes. New Yorkers unfortunately have a restricted number of deposit methods at Ignition. In fact, they're limited to crypto-currency (Bitcoin and Bitcoin Cash) only. If you aren't exactly sure how to deploy these forms of digital cash for online poker playing, then you can consult our Bitcoin poker guide and our instructions on using Bitcoin Cash for online gaming. It really isn't as daunting or difficult as it may first seem and our guides visually show you with step-by-step screenshots, how to purchase and use BTC and BCH. The standard download poker client is available for both Macs and PCs. You're also welcome to use your phone or tablet to access a web-based poker platform although this interface has only cash games and Jackpot Sit & Go; multi-table tournaments and normal sit-n-goes are absent. If you wish to partake in fully featured gambling from your mobile, then the Ignition casino has hundreds of titles waiting for you. You'll get a 100% up to $1,000 bonus for this casino on top of the identically sized bonus for poker. Click through the banner shown above if you're eager to begin your Ignition Poker journey today. You may find it prudent to first pore over our well-researched Ignition Casino Poker review page. Many New Yorkers like playing at Sportsbetting.ag, on the Chico Poker Network, because of its bustling player volume, plethora of promotions, and soft tables inhabited by weak opposition. Upon making your first deposit at SB.ag, you'll receive a 100% up to $2,500 poker bonus that clears at a rate equal to 33% rakeback. The ring game action here starts at $0.05/$0.10, and it goes all the way up to $5/$10 in No Limit Texas Hold'em poker, Pot Limit Omaha, and Pot Limit Omaha/8. Sit n' goes are a pretty popular type of contest at Sportsbetting.ag with the low end comprised of $1.50 SNGs and the higher buyins reaching up to $200 + $15. Both of these types of poker have been expanded to include Boost Poker, SB.ag's version of fast-fold cash games, and Windfall, a three-person lottery poker variant where the prize pool is determined by multiplying the buyin amount by a random multiplier. The cash up for grabs can be as high as 2,000 times the buyin. The download poker software comes in Mac and PC versions, and in addition, there's a mobile app if you should feel like playing poker away from home. The mobile poker client deployed at the CPN is among the richest, easiest-to-use such programs that we've ever come across in our online poker explorations. Besides the smoothly functioning poker room, you'll also get to play in a casino, a sportsbook, a racebook, and a few other distinct gambling platforms. Cash gamers, SNG fans, and multi-table tournament aficionados all have their own leaderboards to compete in every week. In total, these points-based competitions award $20,000 every seven days to the most prominent achievers in their discipline of choice. You'll also earn comp points while you play that you can exchange for valuable tournament buyins. Another interesting feature at Sportsbetting.ag is the Bad Beat Jackpot, which triggers at specially designated tables when quad jacks or better loses at showdown. The BBJ has grown to more than $990,000 in the past. Click the banner above to begin your quest for big poker winnings. If you'd rather get more info first, then check out our review of the Sportsbetting.ag poker platform. Or you can check out their sister site BetOnline! Those looking for bustling lobbies on the PaiWangLuo Network can choose to open an account at Bovada instead of Ignition because both sites spread the same poker games. The difference is that Bovada has a sportsbook and a racebook, both of which are absent from Ignition Casino. New poker customers at Bovada.lv get a 100% up to $500 bonus, however, so they're rewarded with only half as much free money to use in the cardroom as their brethren at Ignition. Within the sportsbook, you'll find all the types of athletic competitions you would expect: baseball, football, soccer, basketball, MMA, and more. Even if you're a fan of obscure sports, like Gaelic games and cricket, you'll find a pretty decent selection of lines being offered. The esports division is especially noteworthy because you can put money down on the results of major tournaments in Counter-Strike: Global Offensive, Dota 2, League of Legends, and other popular competitive video games. The Bovada Sports bonus is a 50% up to $250 deal that jumps up to $500 if you deposit with Bitcoin. With your sports betting bonus money, you can also wager on the ponies at approximately 200 racetracks. All the familiar betting options are here, including win, place, show, trifecta, superfecta, and many other exotics. Boxing and wheeling your selections is permitted. For casino fun, Bovada has you covered. Just as partner site Ignition does, Bovada lets you play hundreds of titles from such leading development houses as Realtime Gaming and Rival Gaming. There are even a handful of proprietary games, like “A Night With Cleo” that were created in-house and are not found at many other internet casino destinations. Casino leaderboards let you race against other players to score free prizes, and live dealer games combine the best of both offline and brick-and-mortar gambling. You can take advantage of a 100% up to $1,000 casino bonus on each of your first three deposits for $3,000 in complimentary bonus cash. Transact with Bitcoin to bump this offer up to 150% up to $1,500 times three for $4,500 in total bonuses. If you're ready to open up a new account at Bovada, then just follow the above banner link. To gain a better understanding of this real money gaming operator first, check out our Bovada Poker review. The Winning Poker Network is the second-largest place available online to play cards in New York according to numbers from respected industry resource Game Intel. WPN and its top site, Americas Cardroom, didn't attain this amount of success just through blind luck. This network takes care of its players, which is evident when we consider the 100% up to $1,000 welcome bonus and free $50 that's given to newcomers. The WPN was the first site in the U.S. market to introduce lottery SNGs, which it calls Jackpot Poker. These games begin when three people register, and the prize pool is determined by a random number that can equal 2,500 times the buyin! Another type of SNG that incorporates random elements is a nine-handed affair called SNG 2.0. Of course, you'll also encounter normal single-table competitions at stakes both low and high. Through the weekly Sit & Crush leaderboard, the most dedicated sit n' go grinders are rewarded with cash prizes and satellite entry tokens. Cash games encompass price points as low as $2 buyin games and as lofty as $5,000. This is true in both PLO and NLHE, and even the uppermost of this spectrum sees real money play from time to time. Other games present include PLO/8, Seven Card Stud, and Limit Omaha Hi-Lo. Every hand you play, except in heads-up matches, counts toward The Beast leaderboard, which has paid out more than $15 million over its history. The most exciting part of the Americas Cardroom product lineup, however, is the tournament lobby. The weekly Sunday Special, costing $200 + $15 to join, has the highest guarantee of any regular, weekly MTT open to Americans: $150,000. ACR is also host to the largest recurring tourney for U.S. residents, the Million Dollar Sunday. This has a buyin of $250 + $15, and it pays out no less than $1,000,000 every time it runs. Tournament series, like the Online Super Series, give you something to look forward to if you like the structure and potential profitability of a procession of big tourneys. To create your ACR account today, click on the banner above. For an in-depth analysis of the elements that make this a top-tier NY online poker room, take a look at our accurate review of the Americas Cardroom poker offering. Americas Cardroom is a member of a poker network, and as such, it doesn't run the whole show by itself. If you wish to learn more about the organizations that have joined forces to bring you superb poker gameplay, then BlackChip Poker (read review), True Poker (read review), and PokerHost (read review) are some of the names to keep in mind. If you're searching for a good rakeback deal, then our page on WPN rakeback ought to meet with your approval. Grand Poker Network doesn't have the same extensive history as many of the enterprises we mentioned above, but this is OK because its leading company, 5Dimes, does. It's one of the most well-respected bookies online, and it's known for its fair dealings with players and its support for many desirable payment processors. When you open up the lobby at the 5Dimes poker room, you may be slightly surprised to see that there are seldom more than a dozen active games in total. Like we said, this is a newer site, and it's still growing its player base. The tables that are populated tend to be quite juicy because sophisticated poker pros haven't yet latched onto this site. Ring games are capped at $1/$2, and tourneys have a maximum buyin of just $5 + $.50, so if you're a high-roller, we advise you to make one of our other recommended options your poker home instead. If you're just getting started on your poker adventure, though, then 5Dimes is one of the best rooms you could play at. The everyday low rake, combined with our 50% rakeback special, means you won't get bled dry over time as you pay the house its share. Furthermore, some of the sub-$5 tournaments here have no house fees whatsoever, giving you a chance to build up your roll even if you're not Phil Ivey or Daniel Negreanu. You can play in a $500 freeroll every Sunday to attempt to run up your balance. Become a member of 5Dimes today by clicking on the link above and registering your account. Our Grand Poker Network review is a great place to go to get a better handle on what this site has to offer. New York is a financial hub for the world, and so it's no wonder many New Yorkers have begun dabbling in the digital cryptocurrency Bitcoin. Nitrogen Sports Poker allows you to indulge your fondness for freedom and anonymity by permitting you to play directly in BTC without having to ever use fiat currencies whether for deposits, withdrawals, or actual buyins at the tables. Each chip is worth 1/1,000 of a bitcoin. There's a decent selection of micro-stakes NLHE here, but action above about .10/.20 is sparse at best. You can also find a game or two of PLO and LHE from time to time. Many of the tournaments come with guarantees, and there's at least one freeroll per day. As you play at the tables, you'll get a spendable rewards currency called Nitro, which can be exchanged for sports free bets and direct mBTC credits to your balance. Needless to say, withdrawals are super-fast and come with the low fees that typify Bitcoin transactions. You can sample the BTC poker room at Nitrogen by following our banner link above. Read more about what this innovative firm brings to its customers in our comprehensive page covering Nitrogen Sports Poker. Descended from the first Bitcoin-only poker operator on the planet, SwCPoker continues in the tradition of dox-free, no-nonsense poker thrills. Your virtual chips are each worth 0.001 BTC, and since you never have to trade them in for USD at any point, there are no conversion charges, exchange-rate manipulations, or any other shady financial tactics. SwC is the leading poker site in the New York market for “other” poker games, like Razz, HORSE, Open Face Chinese, Limit Omaha-8, and 8-Game. The rake here is super-low, and you can hook yourself up with a refund on the rake you do pay through the Krill program, which tracks your history and delivers higher-percentage returns the more you play. The poker rake at SwC is some of the lowest online, so even without factoring in the Krill rakeback, you're still getting a superb value when you play cash games at this room. Hit up the link above to go directly to SwCPoker. You can also peruse our carefully compiled SwC page for all the details on what to expect. Now that we've listed some of the top organizations dealing online poker in New York, it's about time we let you know how to choose where to play. No single room is best in all categories because they each have their own pluses and minuses. It's ultimately up to you to evaluate their features and pick the most attractive option. We realize that this can be difficult, so we've come up with a handful of things for you to consider. + If you think it's critical to be able to pick and choose from the largest number of active games, then Ignition and the Winning Network have the highest traffic numbers. + If you're eager to start playing poker on your mobile device or Mac, then Chico, Ignition, Grand, and Nitrogen all feature the cross-platform functionality that you seek. + If you feel that you deserve a huge welcome bonus, then there's no doubt that Chico Network's $2,500 deal is among the biggest to be found anywhere. + If you enjoy lottery-style SNGs, then Ignition, WPN, and Chico are the three destinations that support these types of games. + If you're looking for cash games in less-common poker variants, then SwC is number 1 while the WPN is a distant second place. + If you believe that Bitcoin is the wave of the future, then Nitrogen and SwC permit you to play poker without using fiat money at any point. All of the sites we work with allow you to use virtual bitcoins to both fund your accounts and receive your winnings. There are other methods available, like credit cards and money transfer services, but these tend to be a bit cumbersome to work with. Bitcoin permits you to avoid the exorbitant surcharges and lengthy waiting times that sometimes come with traditional payment solutions. If you haven't yet opened your Bitcoin exchange and wallet accounts, then you can learn how to do so here. For general information on payout processing speeds, browse over to our monthly U.S. poker payouts report. The laws pertaining to wagering activities in the State of New York are contained in Article 225 of the Penal Code. After looking over this chapter thoroughly, we conclude that there's no law penalizing individuals who participate in online poker games. You have nothing whatsoever to fear from the law in this matter. 12. “Unlawful” means not specifically authorized by law. 2. “Gambling.” A person engages in gambling when he stakes or risks something of value upon the outcome of a contest of chance or a future contingent event not under his control or influence, upon an agreement or understanding that he will receive something of value in the event of a certain outcome. 1. “Contest of chance” means any contest, game, gaming scheme or gaming device in which the outcome depends in a material degree upon an element of chance, notwithstanding that skill of the contestants may also be a factor therein. The wording contained herein is duplicated more or less verbatim across several jurisdictions throughout the United States. It applies the Material Element Test, which is somewhat vague and open to interpretation. In his 2012 ruling in the case involving NY poker room owner Lawrence DiCristina, Federal District Judge Jack Weinstein presented compelling evidence for the proposition that poker is a game of skill. “Advance gambling activity.” A person “advances gambling activity” when, acting other than as a player [emphasis added], he engages in conduct which materially aids any form of gambling activity. Other parts of the law make it clear that someone organizing, providing equipment for, and inviting people to a game in which he or she derives no financial gain, except through actual gameplay, is considered just a player for the purposes of these rules. Thus, social home games are unquestionably legally OK.
3. A coin operated gambling device with intent to use such device in the advancement of unlawful gambling activity. We can dismiss parts 1 and 3 right away because there's no way a PC is a slot machine or a coin operated gambling device. And the second part only comes into play if the accused acts “believing that the same [the device] is to be used in the advancement of unlawful gambling activity.” We've already seen that advancing gambling activity isn't taking place if someone is acting merely as a player. So these restrictions won't affect you if you just play poker on your machine normally. The State of New York goes after operators, not regular players. The penalties on the books for illegal gambling firms aren't very severe. These infractions are categorized mostly as misdemeanors or low-level felonies. One reason that some poker sites refuse to operate in New York is that perceived violations of state law can trigger the activation of much more severe federal codes. The events of Black Friday in April 2011 loom large in the minds of gambling operators. Around a dozen people connected with PokerStars, Full Tilt Poker, and Absolute Poker were indicted on various federal gambling-related charges in the Southern District of New York. There were also multi-million dollar civil suits involved. Nevertheless, some internet poker sites are willing to take the risks involved in catering to the New York market. You'll be able to successfully play cards from the comfort of your own home despite the fact that your options are a bit more limited than in some other states. As one of the original 13 colonies of the United States, New York held a population that was not averse to taking risks whether we're talking about crossing the Atlantic to seek a better life or putting their money down on the turn of a card at the gaming tables. Because it wasn't quite as puritanical as some of its New England brethren to the north, it probably exceeded them in toleration for gambling. As with many New World colonies at this time, lotteries were especially popular as they were seen as an easy way to raise funds for public improvement projects without levying taxes. Yet after American Independence, New Yorkers moved to halt further lottery sales with a rule in the 1821 state constitution against forming any new lottery organizations. In 1848, those preexisting lotteries that had been grandfathered in under the 1821 constitution were barred from operating as well. In the 1890s, the House with the Bronze Door became famed as THE place to go for luxurious upscale gambling in Gotham. Located on 33rd street in Manhattan, the ornate bronze portal which lent the establishment its name presented a respectable if somewhat ordinary image to unknowing passers-by. Within the rooms of the building, however, one encountered sumptuous décor: velvet carpeting, marble sculptures, oil paintings by the masters, and all the other accoutrements of a tastefully arranged aristocratic mansion. The Bronze Door itself was rumored to have been imported from Venice and cost $20,000 – about half a million dollars today. Clearly, this was not a casino that catered to the average Joe. In addition to faro, roulette, baccarat, and several other popular house-banked games, it featured rooms to which members could adjourn for private gaming. Poker was one of the pastimes that the well-to-do indulged in away from the prying eyes of the public. The largest pot in these games was reportedly $27,000, which was won by a full house of AAAKK. We can thus gauge the kinds of stakes being played for by comparing this figure to the exorbitant cost of the totemic Bronze Door itself and what that amount is equivalent to today. New York got a new constitution in 1894, and it banned all types of gambling, so the days of the House with the Bronze Door and other, humbler betting parlors were numbered. The House was shut down by the authorities in 1902. Several successor underground casinos popped up, but none compared with the original either in terms of aesthetic splendor or the level of the action taking place. Rather than disappearing altogether, gambling businesses found ways around the restrictive laws. This was especially true after Prohibition was passed in 1920. 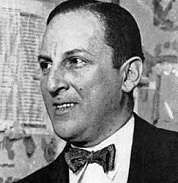 Pioneering NYC bootlegging crime boss Arnold Rothstein, implicated but eventually cleared in baseball's 1919 “Black Sox” scandal, became the big name in illicit gambling parlors, which contributed to his alleged fortune of $10 million in ill-gotten gains. 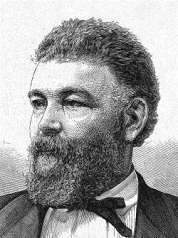 He outmaneuvered the corrupt Tammany Hall political machine to become a major power broker in his own right. It was poker that inadvertently led to his demise. After a multi-day, high-stakes poker game in 1928, Rothstein found himself stuck $320,000. He refused to pay, claiming that the game had been rigged, and was shot dead several weeks later. Perhaps seeking to curtail the exploits of such criminals, the state amended its constitution in 1939 to legitimize pari-mutuel racetrack betting. Charitable bingo followed in 1957 and educational lotteries in 1966. But there was still no place to go for legal poker in New York. Underground gin, backgammon, and poker clubs began to appear in the Big Apple. It was in these environments that players such as Stu Ungar, Howard Lederer, and Erik Seidel got their starts. 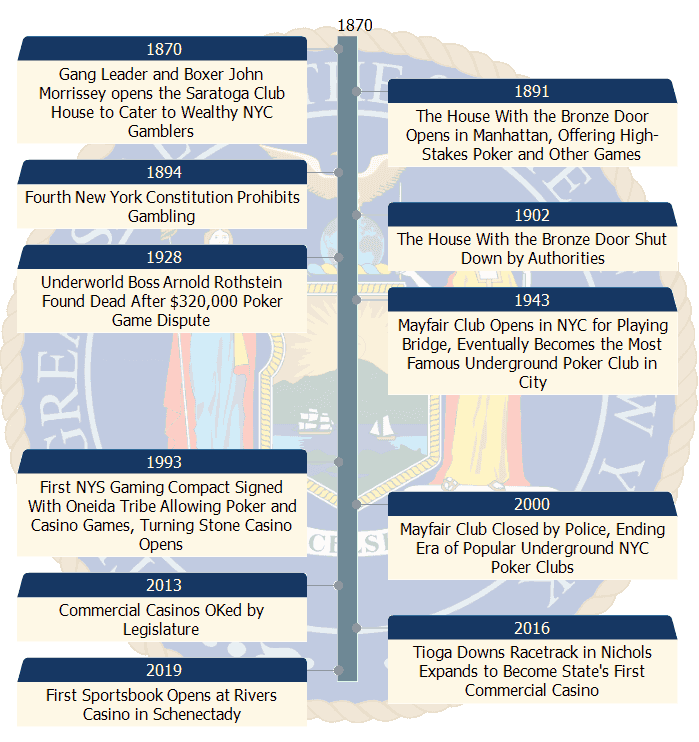 As the years wore on, these establishments became an open secret and hosted cash games at ever-escalating blind levels. One of the sharks in these games was Joel “Bagels” Rosenberg, immortalized in the movie “Rounders” as Joey “Knish.” The most prominent of the clubs was the Mayfair, but it was shut down in the year 2000 during the Giuliani mayoral administration. The remaining unauthorized poker facilities either closed down as well or scaled back their endeavors so as to not attract the attention of law enforcement. In 1993, tribal gaming came to New York with the creation of Turning Stone Casino in the Oneida Nation. In 2013, commercial casinos were authorized in the state for the first time, and three of them opened their doors a few years later. With a population large enough to support several online sites, pretty liberal attitudes in the New York City area, and a demonstrated willingness to allow many types of authorized gaming, New York seems like a no-brainer for licensed online poker. Since 2014, there have been a number of bills introduced that would formalize an internet poker regulation scheme. In 2017, online poker licensing bill S03898 was passed by the Senate, but the companion legislation in the Assembly, A05250, only made it past the Codes committee before time ran out in the legislative session. We appear to be getting closer and closer to success every year, so New York is one of a handful of states that actually seem serious about enabling its citizens to do what they please with their own money online. The five major types of brick-and-mortar gambling are all available in the Empire State. They are tribal casinos, state lotteries, charitable gaming, pari-mutuel racetrack betting, and commercial casinos. One quirk of the way live gambling is set up in NY is that all tribal and commercial casinos are located upstate some distance away from New York City. For the majority of residents in The City That Never Sleeps, a jaunt over to Atlantic City in New Jersey may be more convenient. Turning Stone in Verona has the largest poker room for New Yorkers with 32 tables. Cash games in No Limit Texas Hold'em, Limit Hold'em, Pot Limit Omaha, and Limit Omaha/8 await you. Dealers stand prepared to spread other forms of poker upon request. With a history of poker clubs going back more than a century and a population that exceeds that of almost every other state, it's no wonder that New York has spawned more than its fair share of famous cardsharks. Perhaps the most remarkable of these Gotham hustlers was the unusual Stu “The Kid” Ungar. His father owned an underground Manhattan gambling establishment, and so it's no surprise that young Stu cottoned to the trade as he was growing up in the '50s and '60s. First devastating his opponents in gin rummy circles, Ungar eventually had to transition full time to poker because nobody wanted to play gin against him for real money. His success continued, and he won three World Series of Poker Main Events: 1980, 1981, and 1997. Stu also picked up another two WSOP bracelets, one in the 1981 $10K Deuce to Seven Draw event and other in the 1983 $5K Seven Card Stud event. Unfortunately, Stu Ungar's personal habits marred his poker career. He was fond of splurging on expensive meals and betting on sports where he lost a bundle. As the '80s began, he became addicted to cocaine. Little more than a year after his final World Series championship in 1997, he was found dead in a Las Vegas motel with only $800 on him and no other assets to speak of. 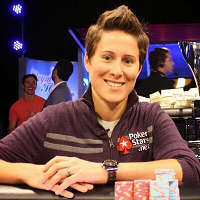 Another New Yorker who made a mark on the game is Brooklynite Vanessa Selbst. While attending Yale as a Fulbright scholar, she picked up poker. First playing in private games with her classmates, she soon graduated to cash games in Foxwoods before heading out to Vegas. Vanessa has taken home three gold bracelets at the WSOP: the 2008 $1,500 PLO, the 2012 $2,500 10-Game 6-Max, and the 2014 $25,000 Mixed-Max NLHE. However, her largest cashes were in non-WSOP tourneys. She scored around $1.8 million for winning the 2010 €7,750 Partouche Poker Tour Main Event and then picked up approximately $1.4 million for her victory in the 2013 PCA €25,500 High Roller event. In total, Selbst's live tournament winnings exceed $11 million. For her phenomenal success in multiple variants of poker, many consider her the best female player of all time. Other prominent New Yorkers in the world of poker include 1988 WSOP ME runner-up Erik Seidel, double bracelet-winner Nick Schulman, Andrew “LuckyChewy” Lichtenberger, and Scott Seiver. There aren't as many alternatives for online poker in New York as there are in some other parts of the country, but you can still play cards over the internet as much as you wish. There are no laws against playing privately for your own recreation and profit. Choose a good New York online poker site, and shuffle up and deal! Do you have an address in a nearby state? If you are lucky enough to have another address in a nearby state, be it your business address, summer home, second apartment, family home, etc, you may have other online poker options available to you. Here are a list of the states that border New York and Professional Rakeback's review on each of them: Pennsylvania, Vermont, Massachusetts, Connecticut, Rhode Island, Ohio, New Jersey, New Hampshire, Maryland, and Delaware. Many New Yorkers are jet setters and travel all over the country and the world. Thus, it would not surprise us if you, as a New Yorker, happen to have a secondary residence outside of the handful of states we just mentioned. But fear not, we have more information for you to gobble up. Take a look at our Online Poker Guide for US players, which has data regarding real money play on all 50 states. From there, you can easily find a poker site to play at, or zoom in and check out the options in any other state of the union. Unfortunately many players across our country don't realize that they have options to play poker online. If you've found this information helpful, please take a moment to share it with your friends and family and thus help to grow the game that we all love so much. New Yorkers sometimes have questions about the prospect of playing online poker in the state. Look below for a compilation of some of the most common questions and their answers. Are there any state-regulated online poker sites in New York? New York seems to be a natural fit for licensed internet poker because of its socially liberal values, large population, existing casino culture, and relatively high level of income. Indeed, there have been yearly legislative pushes toward legalization. However, none of these bills have passed into law. Therefore, only offshore sites are able to provide legal New York online poker. Is it legal to play internet poker for real money in New York? All of the statutes that pertain to playing poker within the Empire State deal with the operators of the games, not individual players. This is the case for both offline and online poker. Therefore, there's no chance of your getting into trouble with the law if you elect to fire up a few tables at your favorite virtual cardroom. Is PokerStars legal for New Yorkers? It's legal for PokerStars to offer its services throughout the State of New York. However, it does not currently accept players from NY or any other state except those where it is explicitly authorized to do so, like New Jersey. This is a result of the settlement the company entered into in the wake of Black Friday when it agreed to abandon the unregulated U.S. market. You can cross over into New Jersey and play on PokerStars even if you reside in New York, but this NJ PokerStars site is ring-fenced and nowhere near as distinguished and busy as the global 'Stars platform. Is Ignition Casino Poker legal in New York? Ignition is a member of the PaiWangLuo Network, which is based in Hong Kong and follows the laws in force in that jurisdiction. The company used to not accept customers from New York, but it now does. It bases its international business on well-understood trade rules and multi-lateral treaties under which the provision of cross-border online gaming is a fully protected endeavor. Thus, while the federal authorities may take a dim view of these activities, it's unlikely that Ignition could ever be held to be violating U.S. law. Is BetOnline a legal New York poker room? BetOnline transacts with clients in every state of the Union, including New York. It's not deterred by the ill-advised proclamations of crusading politicians and law enforcement officials. BetOnline's worldwide internet gambling pursuits are covered under trade rules, like those of the World Trade Organization. This body has already determined that the United States isn't living up to its obligations by treating internet gambling firms as though they were breaking the law. Most third-party observers believe that BoL is acting in accordance with the law. I see that Global Poker operates in New York, is it legal? Global Poker has an unusual business model that it says keeps it from breaking federal and state anti-gambling statutes. However, we believe that these claims aren't exactly ironclad. A detailed discussion of this aspect of Global's operations is beyond the scope of this FAQ, but you can peruse our poker review of Global for additional information on this subject. What is the minimum age for gambling in New York? New York has established a minimum age for gambling of 18. This is in alignment with what most other states and countries have decided, and it's also the age that most online gambling sites use as a cutoff too. As long as you're older than 18, you can play to your heart's content. Can I organize and run my own online gaming company in New York? No, it wouldn't be a good idea to open up your own internet gambling enterprise. Although you're perfectly secure in your role as an ordinary player, your legal liability changes drastically once you step over the fence and into the role of operator. There are quite a few different charges that can be brought against New Yorkers who are engaged in the business of running a gambling operation. Even worse, the commission of gambling crimes at the state level can trigger the application of serious federal statutes. Just look at the examples of the 18 people arrested in 2007 for illegal online sportsbook infractions and the 6 who were indicted for similar offenses in 2016 for info on what can happen if you attempt to take this course to fast but dangerous profits. How can I make deposits and withdrawals to and from online poker rooms? We recommend that our readers conduct their internet gaming cashier functions using digital crypto-currency. Bitcoin Cash, Ethereum, Litecoin, and other coins have their uses, but the crypto with the widest acceptance at online poker rooms is the original one: Bitcoin. It permits you to get your cash quickly and relatively anonymously. Fees are low, and BTC transactions tend to be a lot speedier than old-school payment processors. Nevertheless, if you do wish to use traditional methods of moving your money around, you can employ credit cards, money transfer services, checks, and other standard monetary tools. Do I have to pay taxes on my online poker winnings? Both the Internal Revenue Service and the New York Department of Taxation and Finance expect to collect their share of any winnings you should collect from your poker playing. Your tax obligations will vary a lot depending on your general income level, the amount you win, and the way you choose to file your tax paperwork. Unless you really know what you're doing, we think it best to consult with a professional CPA or tax preparer if you earn a substantial amount from your card play. Is it possible to play poker on my tablet or phone? Mobile compatibility has been a priority for internet poker firms for several years now, and so apps have appeared that work with iOS and Android machines. Even at sites that don't offer dedicated downloadable mobile apps, there are often web browser poker clients that work on a broad range of hardware, including modern smart devices. Among the internet cardrooms that welcome New Yorkers, the Chico Network, Grand Network, and Nitrogen allow mobile users to access virtually all of the games they spread. In addition, Ignition and Americas Cardroom have limited mobile software programs that allow their customers to play a subset of their games from their mobiles. Are there any Mac-compatible internet poker sites? Yes, there are a number of places to play cards if you're on a Mac system. For those in NY, they are Ignition, Chico, Grand, and Nitrogen. Americas Cardroom also has a Mac client, but it's still in beta and somewhat buggy. At some poker rooms that don't feature Mac support, it may be possible to run the Windows software through emulation software. Is the underground NYC poker scene any good? There are a number of establishments that organize low-key live poker games in New York City. We advise you to stay away. The heyday of these types of clubs is long past, having concluded around the end of the 20th century when the authorities stepped up their enforcement actions. Another issue is the exorbitant rake, which can be as high as 10% up to $17. It's far better to play online where the rake is usually just 5% up to $3. We strive to maintain this information and update it frequently with our research. However, we are not immune to making mistakes or omitting information that you, dear reader, may find of use. If you have any further questions not addressed in this guide or have noted any discrepancies or inaccuracies we urge you to contact us with your questions and concerns so that we may swiftly address them! Permalink Submitted by SSC-Ry (not verified) on Tue, 04/03/2018 - 16:22. Are there any sites that don't allow HUD's that a Mac user from NY could play on? Permalink Submitted by PRB Responds on Tue, 04/03/2018 - 19:27. None of the NY-friendly offshore sites necessarily ban the use of HUDs. Those that don't necessarily want HUD users choose simply not to cooperate with the major HUD company that owns Poker Tracker and Holdem Manager. Thus, effectively, most HUD users are shut out. Some enterprising people found ways to make hand history converters that allow PT4 and HM2 to work on various sites that don't really want them, but it doesn't seem like much of anything is done about this by the sites. You could play on Ignition, BetOnline / Sportsbetting.ag, any Grand Poker Network skin and they would allow you from NY as well as have Mac software. None of them are "HUD-friendly" though on the first two, there are hand history converters that allow the use of PT4/HM2. With that said, you might want to rush off to play at Grand Poker. And there is nothing wrong with that. Just know that they are a small poker room where you will likely find no more than half a dozen to a dozen games running at any given time across all stakes and levels.